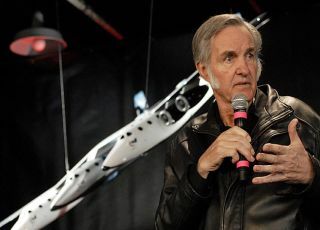 Aerospace pioneer Burt Rutan discusses the design for SpaceShipTwo, a suborbital piloted spacecraft under construction by his firm Scaled Composites on Jan. 23, 2007. The craft will serve as the workhorse for Virgin Galactic's space tourism flights. An ongoinginvestigation into a fatal explosion last summer has delayed rocket enginedevelopment for the passenger spacecraft SpaceShipTwo, the vehicle?s leaddesigner has said. Aerospacepioneer Burt Rutan, who is building the suborbitalSpaceShipTwo with his Mojave, Calif.-based company Scaled Composites, saidthe firm must first determine the cause ofthe July 26 blast that killed three Scaled workers and injured three othersbefore completing the spacecraft?s rocket engine. ?Noquestion, we are having delays in development of the rocket engine,? Rutan saidafter unveiling designs for SpaceShipTwo and itsWhiteKnightTwo mothership in New York City on Jan. 23. ?We just don?t know howlong those delays will be yet.? Scaledengineers are building a fleet of five SpaceShipTwo vehicles and twoWhiteKnightTwo carriers for the space tourism firm Virgin Galactic founded by Britishentrepreneur Sir Richard Branson. Virgin Galactic is selling $200,000tickets for rides aboard the air-launched SpaceShipTwo vehicles, each of whichis designed to carry six passengers and two pilots to the edge of space andback. Rutan saidhis firm is committed to isolating the source of the explosion, which occurredat the Mojave Air and Space Port during a cold flow test of the nitrous-basedoxidizer to be used in SpaceShipTwo?s rocket engine. The test,Rutan said, is one that had been performed several times for SpaceShipTwo andits predecessor SpaceShipOne, which won the$10 million Ansari X Prize for suborbital flight in 2004, and was thoughtto be safe. SpaceShipOne used a rocket motor powered by liquid nitrous oxideand a proprietary mixture of rubber-like propellant to launch itself and apilot into suborbital space. ?We werewithin a couple of weeks of doing our first hot firing and really learning alot about this brand new motor that?s being developed,? Rutan said of thetiming of the explosion. VirginGalactic CEO Will Whitehorn said last week that the first SpaceShipTwo,currently under construction, remains on track for a planned rollout later thissummer. The spacecraft is slated to undergo an initial round of test flights bynext year, pending the resolution of its rocket engine work, he added. ?We?re notin the business of making predictions,? said Whitehorn, adding thatSpaceShipTwo and its carrier craft must also pass a series of other tests before theirfirst flights. ?We?re going to have a comprehensive program.? Earlierthis month, California state occupational safety inspectors issuedcitations to Scaled and fined the firm $25,870 in connection with the Julyexplosion. Rutan said his firm is working with state officials, as well asaerospace industry experts, to isolate the exact cause of the explosion toenhance future safety at Scaled and beyond. ?I can tellyou for certain that, when we do determine the cause, that it will be publishedso that it can?t happen to others,? Rutan said. ?But we don?t know yet whatcaused the detonation. ?